Dr. Michael Nabil Sanad, a 25 year old Egyptian veterinarian, has been sentenced to three years behind bars by a military tribunal. Today marks the 42nd day the blogger and pacifist has been on hunger strike for what his family says is the “ill-treatment” he has received at Al-Marg military prison, in Quliubia. Michael’s health has critically deteriorated and he has lost a great deal of weight as he continues to refuse to end his strike. Recently, he also began refusing to take his heart medication. The controversy surrounding his detainment has resulted in weak support by Egyptian activists and rights groups, as well as the local media’s continued refusal to report on his story. Michael’s case is extremely “controversial” and therefore before I delve into the details I would like to clarify my position on two important issues. First, members of my family include three respected Generals in the Egyptian Army, one of them a highly decorated war hero of the 6th of October War of 1973. Therefore, my opinions regarding our army can only be seen in light of my slightly biased position. Second, I am pro-Palestinian and therefore strongly against Israel’s widespread, systematic and gross violations of human rights, its mass killings and collective punishments, demolition of houses, closure of the Palestinian territories, which according to the UN Commission on Human Rights constitute crimes against humanity. I am also against Israel’s “unlawful killing,” “extension and wanton of destruction of property; obstruction of medical assistance and targeting of medical personnel; torture, and the use of Palestinians as ‘human shields’ which according to Amnesty International constitute war crimes. I do not hate people simply because they are Jewish. My attacks will always be directed at Israel’s government, its politicians and its policies but never at a people or a race. I do that, not out of a naïve sense of worldly love and human reconciliation. I do that out of respect for my own values and principles. Simply put, it defines me. It is who I am. Michael Nabil, however, has extremely different opinions than my own regarding Israel. In 2009, he created a Facebook page called “No to Compulsory Service Campaign,” in protest against the compulsory three-year military service of Egyptian males. His reason was outrageous by Arab standards: “I don’t want to point a weapon at a young Israeli, recruited into obligatory service, defending his state’s right to exist,” he explained. Michael admired Israel, rejected what he called Arab terrorism and published an Arabic language website of the Israeli foreign ministry entitled, “Why I Am a Pro-Israel.” He studied Hebrew and had a Hebrew section on his blog. As a result he has been accused of being a traitor, an Israeli spy and a Zionist agent. Ultimately, Michael states the reason for his pro-Israel stance is that he is a pacifist, or as he puts it in Arabic (سلامي). The problem with Michael Nabil’s case is he isn’t being jailed for any of the reasons that Egyptians hate him for. He isn’t being jailed for being a spy, or a traitor or a Zionist agent or even for writing a pro-Israeli blog. Michael was sent to jail because he wrote a blog criticizing the military. His crime is “insulting the military” for which he was sentenced to three years in prison. However, the Egyptian Penal Code does not contain a similar provision. This “crime” is being tried under military law, therefore bypassing civilian laws and courts. Dr. Nabil’s detention is considered a violation of his right to hold opinions without interference, which is stipulated in the Egyptian constitution. Moreover, Egypt has been a signatory to the International Covenant on Civil and Political Rights (ICCPR) since 1982. Article 19 of the ICCPR as well as Articles 18 and 19 of the Universal Declaration of Human Rights (UNDHR), adopted by the UN General Assembly on 10 December 1948, both support freedom of expression. Amnesty International said it considers Michael Nabil “a prisoner of conscience, detained solely for peacefully exercising his right to freedom of expression.” Furthermore, Dr. Naguib Gabriel, head of the Egyptian Union for Human Rights Organization, has sent a message to the Supreme Council of Armed Forces requesting equal treatment for Michael in line with recently freed activists Loai Nagati and Asmaa Mahfouz pardoned for the same crime. On these grounds alone Michael should be pardoned. By making exceptions to the rule of law, and basic human rights, we are creating dangerous precedents that will haunt us many years to come. The notion of freedom of expression is intimately linked to the concept of democracy. As a result, Freedom of Speech is enshrined under the First Amendment of the US Constitution. The concept of democracy is that of self-government by the people. For such a system to work an informed electorate is necessary. In order to be appropriately knowledgeable, there must be no constraints on the free flow of information and ideas. Putting limits on freedom of expression mean that public debate may not be complete and voters will not make informed voting decisions. Many famous historical figures have used their rights to freedom of speech to bring about important outcomes. Among those, Martin Luther King’s “I have a dream” speech is one example in the fight to end discrimination. 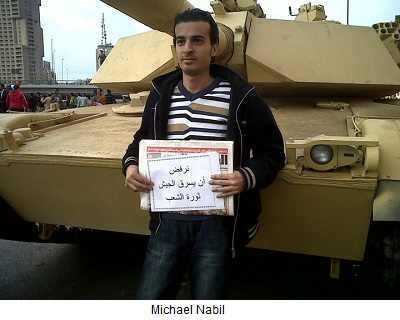 Egyptian youth, including Michael Nabil, used their right to free speech to topple a dictator. But what was Michael Nabil trying to tell us. In his blog, Michael apologizes to his readers for not explaining adequately his reasons. He goes on to explain that while he admires Israeli democracy that does not mean he admires all the actions or policies of the Israeli government. Michael Nabil’s detention is no doubt a difficult case. As an activist Michael chose to express his ideas by creating controversy. That is what activists do. Even in his criticism of the military and his hunger strike, he has stirred a national debate regarding the importance of freedom of expression. In doing so he has contributed to the ongoing maturity of public debate as Egyptians start to embrace the right of others to hold opinions that are radically different from their own. In words attributed to Voltaire, “I may disagree with what you have to say, but I shall defend, to the death, your right to say it”… In contrast, if Michael Nabil is left to die, we will have lost our right to disagree. 1. UN Documnt E/CN.4/RES/S-5/1 19 October 2000. 4. FM Gul: Changes must be made to article 301″. Accessed at http://hurarsiv.hurriyet.com.tr/goster/haber.aspx?id=5835918. Hürriyet. 2007-01-25. Retrieved 2011-10-04. 5. Islam Hussein. What’s in a life: The case of Egypt’s Maikel Nabil Sanad. http://bikyamasr.com/44379/whats-in-a-life-the-case-of-egypts-maikel-nabil-sanad/. Retrieved 2011-10-04. The one who voted no obviously doesn’t care about freedom and ought to live like a slave under a totalitarian regime. I like most of this post except for the part where you say: “The problem with Michael Nabil’s case is… He isn’t being jailed for being a spy, or a traitor or a Zionist agent or even for writing a pro-Israeli blog.” This suggests that if he were imprisoned simply for his pro-Israel views and on false charges of being a spy or traitor, this would be totally ok. Problem being, freedom of expression means freedom of expression, even if someone were to say, for example, that Israeli government actions constitute self-defense and not aggression. Quite frankly, I can’t see the Arab media’s views on the Israeli-Palestinian conflict as anything but propaganda when all views expressing a different opinion on the conflict are silenced, unlike the Western and even the Israeli media, which does allow different views to be expressed. There are in fact a number of Israeli reporters who virulently criticize government policies. Moreover, plenty of Israelis and Jews study Arabic and try seriously to engage the Arabic media and understand the other’s point of view. So why should it be a crime for an Arab to study Hebrew and strive to understand the views of the other? I am living in an Arabic-speaking country now where I am constantly asked about “bias” in the Western, and especially the American media. Quite frankly, I’ve seen a whole spectrum of views published in mainstream American newspapers, including anti and pro-Israel. This is just a shock to Arabs who are used to only seeing one point of view expressed in exaggerated and hyperbolic terms about Israel’s purported evils. It seriously saddens me that the same brave Egyptians who risked their lives to protest and defend freedom of expression are turning their backs on one of the bravest of Egyptians, who is daring to touch even those subjects considered taboo. You already quoted Voltaire… Well, I think Egyptians should “defend to the death” even someone’s right to express pro-Israel views. That would be the greatest test of their commitment to freedom of expression. Hi. Thank you for your valuable comment. Yes, I agree wholeheartedly with the point you are making. I do not think it would be OK to imprison him for his pro-Israeli views, false charges of treason or espionage. But it can be tricky when trying to follow through an argument other than your own. In fact that is the whole point of the article. Although I may disagree with his views on Israel his release is “essential for Egyptian democracy and rule of law”. I personally have no problem with his pro-Israel views even if I disagree with them. That is after all his right. However, I don’t think the comparison with either Western or Israeli media is fair. In Egypt and many Arab countries the struggle for freedom is still underway and far from complete. The ruling junta has clamped down heavily on independent media. First by shutting down AlJazeera offices in Cairo and later by interfering with the popular show host (Yosri Fouda) as well as other media gagging practices. That being said, there are still many problems and biases within Western/Israeli media and comparing them to State sponsored mouthpieces hardly makes your media any less biased. As for the anti-Israeli sentiment I have dealt with this complex issue in two other articles on this blog. Never underestimate what sixty years of dictatorship can do. Also, the West and Israel both haven’t helped. It was after all Netenyahu that defended Mubarak during the revolution while the US hesitated on whose side it should take. However, I personally view the anti-Israel rhetoric as a distraction which has effectively been used by Mubarak’s propaganda machine for decades. You may be interested in knowing that this article was posted on the official website of the Muslim Brotherhood and that further discussion led to an official statement for the brotherhood in defense of Maikel Nabil which echoed the views in this article. This is unprecedented in my opinion and my article has been viewed over 1,300 times. It’s not easy but we’re getting there I hope! Good to know. I hope you are right about his case gaining interest. Insha’allah, there will be larger protests for his release. I hope so! Sadly, more than 12,000 civilians were convicted in front of military tribunals over the past nine months. That exceeds the number of those convicted during the thirty years of Mubarak’s rule. Even demonstrations for the imprisonment of a prominent activist (Alaa AbdelFatah) whose sister created the campaign against military trials for civilians (Mona Seif) has not been effective. The revolution is turning a very dangerous corner in Egypt.